"Finding the one you love...is finding yourself." 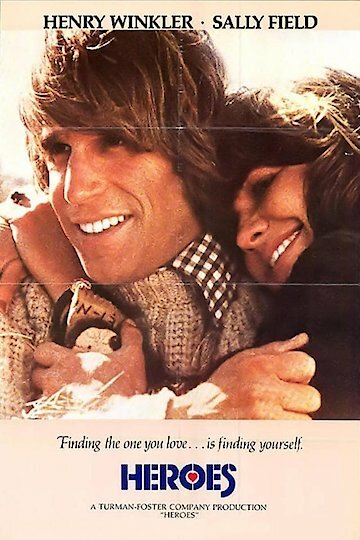 Heroes is a 1977 film that follows Vietnam veteran Jack Dunne (Henry Winkler) in his search for his war buddies in post-Vietnam America, with whom he wishes to start a worm farm in California. Dunne begins as a patient at a psych clinic in New York City. After escaping by dressing as a doctor, he sets off on a bus to begin his cross-country journey. Along his way he develops a relationship with Carol Bell (Sally Field), a woman heading to California to rethink her upcoming marriage. Jack's eccentric behavior annoys her at first, but she comes around and ends up joining him in his search for his friends after an incident that leaves Jack in her debt. As their journey becomes a series of misadventures, Carol's loving attitude serves as an important reality anchor for Jack. Jack's war buddies are quite peculiar characters themselves, reflecting the psychological toll of the war. Ken Boyd (Harrison Ford) lives in a motor home and spends his time driving race cars and playing with the AK47 he stole from the military. Jack's encounters with his former friends challenge his reality and highlight his own mental health condition. Heroes is currently available to watch and stream, download, buy on demand at Amazon Prime, Starz, Amazon, Vudu, Google Play, iTunes, YouTube VOD online.